Ludger, a 34-year old web designer, moved from Hamburg to Cologne, next to her new neighbour Kathrin. She is 24 years old and student. To earn some money besides her studies, Kathrin is working in a café. Preferably she is wearing nylon pantyhoses and Adidas sneakers. 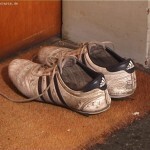 After Kathrin and Ludger met in the stairway by accident, he discovered her sneakers in front of her door one day later. He checked if someone was nearby and stucked his nose deep into the warm and sweaty shoes. Ludger was aroused and got goose bumps because of this fantastic smell. Next day he decided to visit Kathrin with an excuse and they began a nice conversation, because they seemed to like each other. But Kathrin was not stupid, she noticed pretty fast what Ludger had in mind and she asked him, if he is a foot fetishist. The hell froze for Ludger, because there was no escape anymore. He had to tell his old storys and dreams. Kathrin was pleased, she likes it very much if someone massages her sweaty feet after work. So she put off her steaming sneakers and Ludger began to caress the warm and dirty feet. But as if that was not enough, Kathrin ordered Ludger to lie down on the floor. She took off her sweaty pantyhose and Ludger had to wash the nylons with his mouth. After that Kathrin sat down on Ludgers legs and cleaned her dirty soles at his moist tongue. Thoroughly!